The row over the Scottish government's handling of farm payments has rumbled on amid heated exchanges at Holyrood. Ruth Davidson and Nicola Sturgeon both demanded apologies from each other while trading blows in parliament. The government has applied for an extension to the deadline for delivering EU subsidies to farmers. Tory leader Ms Davidson said the first minister had "refused" to tell MSPs the truth about talks with the European Commission about Friday's deadline. However Ms Sturgeon insisted she had been clear - and said the Conservatives should "apologise to the people of Scotland" for not securing extra funding in the confidence and supply deal with the DUP at Westminster. Rural Affairs Secretary Fergus Ewing has confirmed that the government is set to "fall short" of its target of having 95% of Common Agricultural Policy payments completed by midnight on Friday. The Scottish government has applied for an extension to the deadline, and could face financial penalties if this is not granted as it forecasts of having only 90% of payments made in time. The European Commission is yet to respond. An extension was granted in 2016, after problems with a new £178m IT system - something which Audit Scotland says still presents "significant risks and costs for the Scottish government". 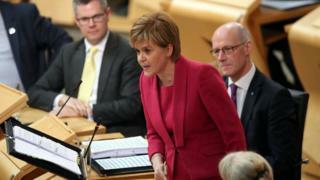 Ms Sturgeon has apologised to farmers for "failures" in the system, but has come under fire from the Scottish Conservatives after details about the latest application emerged only after the first minister was pressed on the matter at Holyrood. Ms Davidson said: "Last week I asked the First Minister three times whether her government had contacted the European Commission to seek an extension to the deadline on farm payments and three times she refused to answer. "There is a reason why I'm raising this again today, it's because there is a principle at stake about the conduct of ministers in this parliament and about the transparency of this government. "I asked the first minister a simple question in this chamber last week and she refused to tell this parliament what she knew to be the truth." Ms Sturgeon replied: "Last week I said we were discussing with the European Commission contingencies around this issue - that is exactly what we we're doing. It is what we continue to do. "Seeking an extension in case we require that extension is exactly that - a contingency." Continuing her attack, Ms Davidson said it took journalists contacting the European Commission for the "facts to come out". She said: "Last week the first minister had to apologise to farmers over messing up their payments again. But now she owes the parliament an apology for not being straight about it." Ms Sturgeon shot back that it was the Conservatives who should apologise, over her government's claim that Scotland is due extra funding in light of the Tory-DUP deal at Westminster, and over the latest round of votes on amendments to the Queen's speech. She said: "I think there is an apology due to the people of Scotland this week and it is an apology from Ruth Davidson for allowing her MPs in Westminster to do two things. "Firstly, allowing them to sit back while Scotland was denied the same extra funding that went to Northern Ireland and secondly an apology for being the MPs in the House of Commons last night that voted to block a pay rise for public-sector workers. Perhaps that is the apology people in Scotland want to see." Elsewhere in the session, Labour leader Kezia Dugdale focused on education, citing figures from the Scottish Parliament's information centre showing reduced spending per pupil in Scottish schools. She said schools needed "cold, hard cash", adding: "Until the first minister commits more funding to our schools using the powers of this Parliament, her promise that education is her top priority is utterly meaningless." The first minister said Ms Dugdale was "downright wrong" about school funding, citing the £750m attainment fund and £120m going directly to head teachers. She said: "This government is taking tough action to reform our education system, to get more powers into the hands of headteachers and teachers and, crucially, to get more resources into their hands." Green co-convener Patrick Harvie led his questions on poverty, urging the first minister to "be bold" and keep the door open to using Holyrood's powers to top-up child benefit. Ms Sturgeon said the Child Poverty Bill would be bold, aid said "the door is not closed to anything that's being suggested". Lib Dem leader Willie Rennie listed issues facing the Scottish government, including the CAP payment delays, concerns the economy could slip into recession and problems facing police and nurses. Ms Sturgeon responded: "That proves that Willie Rennie lives in a wee world of his own most of the time. Sometimes it sounds like quite a fun one, so maybe I will join it one day and take some of whatever he is on." The Scottish Parliament has now gone into recess for the summer, with MSPs returning to Holyrood in September.